Guest post from our Alameda County Coordinator, Heather, who has been planning some amazing and creative events for our large contingent of volunteers in the East Bay. Read about her experience below, and please consider joining her team or one near you for the last stretch of efforts this week! As the Alameda County Volunteer Coordinator, it has been inspirational for me to see people from all over the county come in and give their time to help elect Jerry Brown. It speaks to the candidate and to the amazing volunteers who can imagine a better California and are willing to reach out to their friends, their families and their neighbors to make it a reality. But more still needs to be done. The polls are currently in our favor, but polls are not reality. Just because someone says they will cast a vote for someone does not mean that come Election Day they actually turn in a ballot. That's why we must ensure that every voice is heard, every ballot cast. We want not only California but also the nation to know that this state and our elections are not for sale, that we deserve better for our children, ourselves, our environment, our future. It is not a mandate if only one-quarter of the people who can vote, do vote. And this is a message that deserves to be a mandate. Every time we connect with a voter face-to-face, it increases the likelihood that they will vote by 10 percent. And dropping ten door hangers is the equivalent. We've been lucky to have good turnouts for our debate potluck watch parties and other events, including the So You Think You Can Vote table at the Paramount Theater during the So You Think You Can Dance auditions. But we are kicking it up a few more notches in our big push to Get The Vote Out these final days. This Sunday, we're hosting our very first Knocktoberfest: an afternoon of canvassing followed by an Oktoberfest-themed barbeque, including bratwurst and pretzels - lederhosen optional. On Tuesday, we're throwing a trivia night. Come to phone back and stay for the Jerry Brown and California trivia. Prizes, including some sweet Jerry swag, will be awarded. And on Wednesday, we will be hosting Boogie for Brown at Luka’s Tap Room in Oakland. Phonebank from 6-9 and then enjoy free salsa lessons and dancing afterward. If you don't live near the Bay Area, you can still join in the statewide effort - visit my.jerrybrown.org to join a group near you, sign up for local efforts, and even plan an event of your own. I hope to see you out there on the campaign trail during our final stretch! 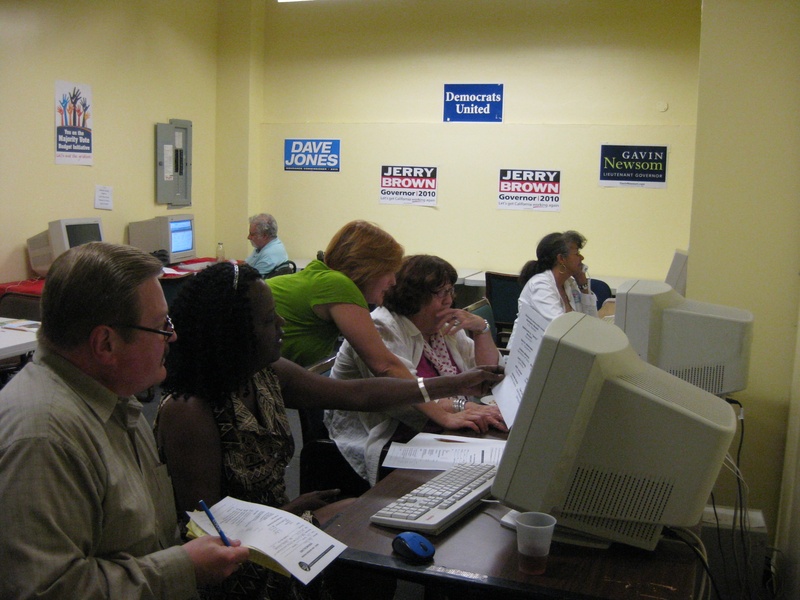 Heather's volunteers hard at work at a post-debate phone bank in Oakland.